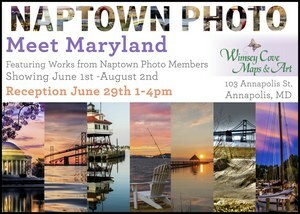 The Meet Maryland show includes the work of 15 Naptown photographers. Bob Peterson, of Annapolis, likes night photography as shown in his night view of Ego Alley in Annapolis. From Edgewater, Mike Lopes is a commercial photographer moving into more art photography. Photos by Dianne Poole Taylor of Deale captures the landscapes which, as she says, “make you feel so relaxed.” Alan Christianson hails from Baltimore and uses photography to “see anew” what most people without a camera miss. And John Goff of Severna Park seeks out mood-changing sunrises and sunsets and unusual landscapes. Others in the show include Carol Allen, Kerri Jolene, Jennifer Palmere, Robbin Haigler, Koretta Skelton, Sharon Shifflett, Denise Phelps, Jen Graves, Christie Wilson, and Katie Zeglis.